Gretchen Sheirr is living the dream. She grew up in Houston, Texas, and was a fan of the hometown Rockets. She was particularly fond of center Hakeem “The Dream” Olajuwon and guard Vernon “Mad Max” Maxwell. Nowadays, Sheirr is herself a Rocket, serving as the chief revenue officer for the NBA franchise. But her love of the team hasn’t changed. Sheirr will be among the Rocket fans in Birmingham on Tuesday, Oct. 2, as her team plays in its home away from home at 7 p.m. against the Memphis Grizzlies in the BBVA Compass Iron City Showdown in Legacy Arena at the Birmingham-Jefferson Convention Complex. The Rockets have – pardon the pun – taken off in the past couple of seasons as they have taken their place among the league’s elite. 2016-17 Sixth Man of the Year Eric Gordon. 2017-18 League MVP James Harden. NBA executive of the year in general manager Daryl Morey. The addition the past two off seasons of Chris Paul and Carmelo Anthony. 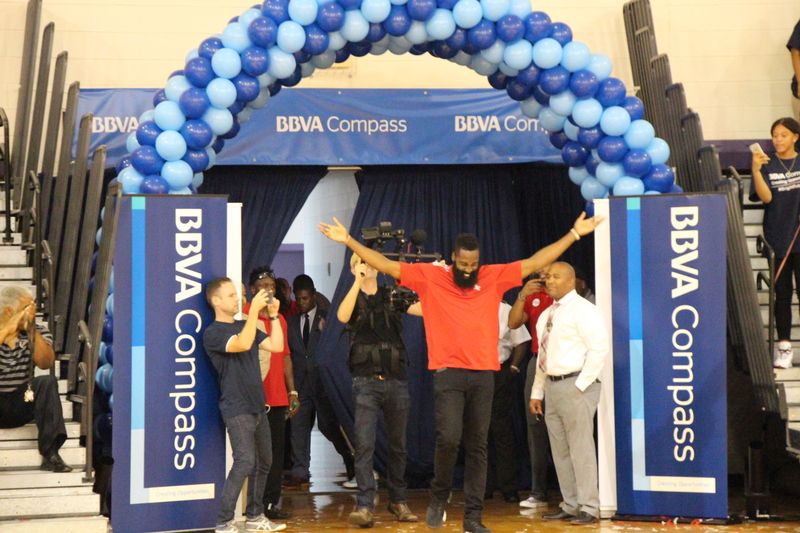 The Rockets and BBVA Compass have a long-standing relationship. 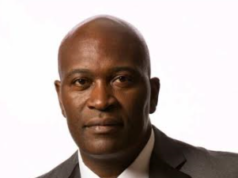 “We have actually worked with them for quite some time,” said Andrea Smith, the Birmingham market CEO of BBVA Compass. “At one point, we had a larger relationship with the NBA. But then also we had a separate relationship with the Houston Rockets and have just enjoyed that partnership immensely. 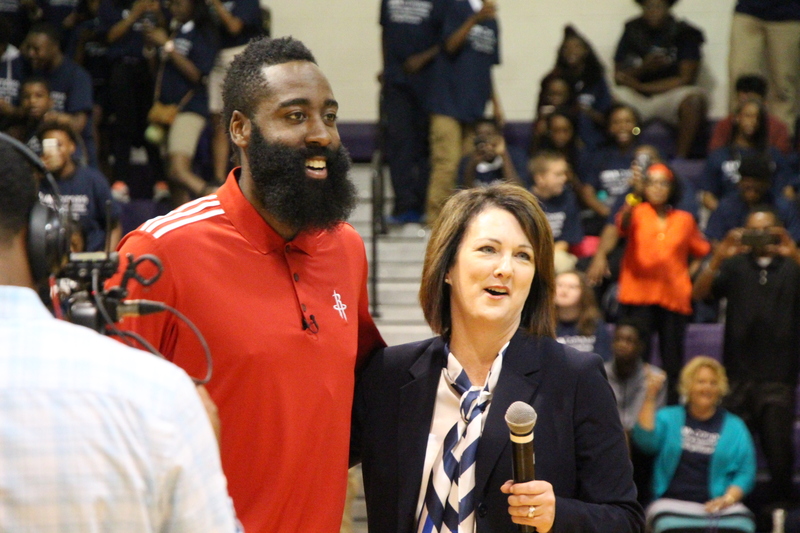 Sheirr said Tuesday’s game has already been a success, dating back to August 17 when Harden joined BBVA Compass execs to announce that the Rockets were coming to town, surprising the student body at A.H. Parker High School. Subsequently, former Houston Rocket Robert Horry, a University of Alabama basketball product from Andalusia (Ala.) High School, was on hand as the Rockets announced their preseason meeting with the Grizzlies. 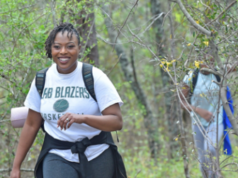 No more excited than Smith, who gets to bring a team she loves – the Rockets – to the city – Birmingham – she now calls home. “Birmingham is the U.S. headquarters for our company,” she said. “Our roots run very deep in Birmingham. We have over right at 3,000 employees in Birmingham. Certainly Birmingham has a special place in all of our hearts. To be able to bring an event to town, an NBA preseason game, it’s just one way for us to bring another opportunity, to create an opportunity for fans and the whole community to come out in enjoy something that people enjoy doing. The Rockets will actually spend two days in Birmingham. 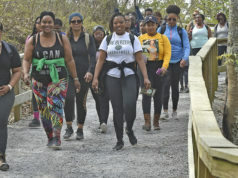 On Monday, they will take part in a ribbon-cutting for the refurbished basketball courts near Legion Field. The ribbon-cutting ceremony will feature Mayor Randall Woodfin, Rockets players, first responders, participants from the A.G. Gaston Boys and Girls Club, and partners from BBVA Compass. Tickets begin at $15. A portion of game proceeds will go to the Alabama Sports Hall of Fame and the Birmingham Athletic Partnership.